Wild camping is something everyone should try to sample at least once, and remember we’re discussing Wild Camping the Mud and Routes way, not the ‘other’ kind in laybys and the like! If you’re a seasoned hill walker, then you’ve got the trickiest part sorted. The hardest part of most mountain trips is the navigation, and if you’re wild camping properly then you’ll need to go places where some map reading skills are essential. Beyond that, you’ll need to choose your kit wisely and learn how to use it. It should go without saying that you need to be able to pitch your tent in any conditions that you expect to encounter, even if that means you’re pitching in the garden with the sprinkler on full pelt. You should also make sure that kit’s suitable for the type of conditions you’re going to be camping out in. You can either cook already, or you can’t. If you can, then wild camping is an opportunity to be creative. For everyone else, there’s always dehydrated food. Beyond that, you just need to be able to sleep in a tent. Our own Dave Roberts loves wild camping, but admits that he sleeps awfully in a tent without a few single malts to set him nicely off. We don’t believe a word of it! To start with, you’ll need everything that you generally take on a day walk, plus a few choice spares. The main kit you’ll need are the ‘Big 3 items; tent, sleeping bag and rucksack. These are the heaviest and often your biggest investment financially, so it’s well worth taking some time and googling any item that takes your fancy. The guide that follows gives you a quick overview of what to look for: Your First Wild Camp. Don’t automatically think that this is the money no object outdoor adventurer activity though, as we’ve proven before at Mud and Routes you can achieve wild camping on a budget. “But what about my luxuries?” we hear you say. Fear not, there’s no reason why you can’t make wild camping that bit more comfortable too if you go in for that sort of thing. Roasted coffee, tables and chairs, even popcorn and projected movies! We’ve become so proficient at it here at Mud and Routes that we’ve coined a category for it, Wild Glamping! Check out our adventures for some inspiration, and let us know of any we haven’t thought of! Five Things That Make A Luxury Wild Camp. Just to be clear from the offset Wild Camping is only legal in Scotland and Dartmoor National Park! For the rest of the UK wild camping is ‘technically’ illegal without the landowner’s permission, so please only pitch up if you get the permission to do so first. If you’re looking for tried and tested wild camping sites check out the Mud and Routes UK wild camping map - Wild Camping Map. What Makes a Great Spot? Just remember, you’ll rarely find a pitch that meets all these crieteria! A Summit pitch with a view will not be sheltered or have running water – but on a still evening it’s worth lugging that water up! Near a source of water. Dry Pitch – Ensure that the water supply isn’t too nearby! Flat Pitch – Any lumps and bumps will make for an uncomfortable night’s sleep. Pitch with your head uphill! Even if you’ve got the best sleeping mat in the world and can overcome a bumpy pitch, make sure your head isn’t downhill if you must use a sloping pitch. Pitching sideways on to the slope will guarantee you’ll be rolling off the sleeping mat at regular intervals. Sheltered – Any sort of breeze makes lightweight tents sound like a load of crisp packets. View – Camp as high as possible to enjoy the view. Failing that, you should try and pitch where you catch the evening rays or if you’re a morning person, facing east to enjoy the sun in the morning. Pitches with views often pose problems with points 1 through to 5! - Camp high, not in a field full of grazing cows next to the farmhouse. - Set up camp late and leave camp early. - Fires are generally a no-no. Fires on a shore might allow signs to be washed away, but we would advise a cooking stove not a fire. - Though in dry spells, which may be a rarity in Britan these days, you’ll need to be extra careful with your cooking stove in case you start a grass or heather fire. Avoid such areas if the conditions are extremely dry. - Leave no trace. Your site should not be an obvious campsite the next day. Take all your litter out, as outlined here. - Human waste also needs to be dealt with, the full Mud and Routes guide on that delicate subject can be found here, which includes the use of sphagnum moss! - Persuade your day walking buddies to wild camp. Some people in your walking circle won’t understand the joys of wild camping, share this with them to make them see sense! So what are you waiting for? 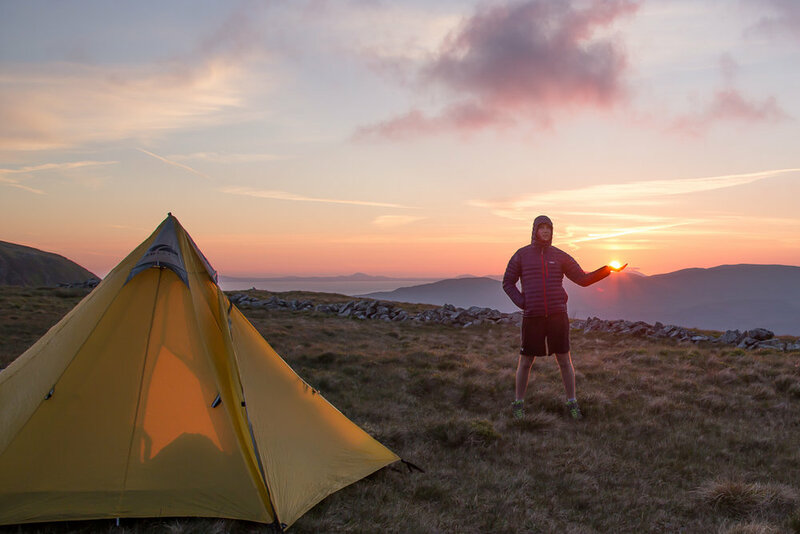 Get planning, GetOutside and enjoy your very first wild camp and be sure to let us know how you get on, we love to see and hear about your adventures here at Mud and Routes. The ultimate website for free walking, trail running, mountain biking and cycling routes.